I've always been fascinated by the Fats Domino / Chubby Checker thing. Forever linked by reciprocal animosity and resemblance not unlike the Hatfields & McCoys. Rangers vs. Islanders. Worse than the great cricket rivalry of India vs. Pakistan. Worse than Bette Davis and Joan Crawford, Popeye vs. Brutus, The Montagues and Capulets, Tupac and Biggie, Yankees / Red Sox, Beatles / Stones, there's Vienna Fingers / Cameo. The silent war. While we sleep, they battle on the shelves of your local supermarché. Nabisco and Keebler go at it with their own versions of oval, vanilla creme filled cookies. The cookies are practically identical. But who came first? Who's Fats Domino and who's Chubby Checker? 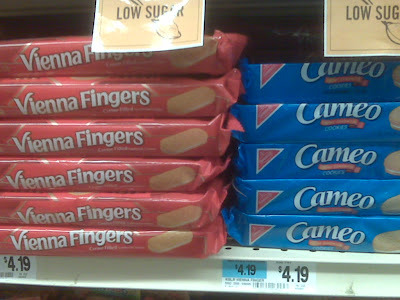 What came first the chicken or the egg, Keebler's Vienna Finger or Nabisco's Cameo? It's the same god damned cookie! This made me think of some other junk food rivalries & copycats. Namely the unforgiving chocolate wars of the Swiss Alps. Somewhere along the way chocolate cake tubes and Switzerland became synonymous. Three different brands battle it out: Hostess weighs in with their HoHo's, Drakes checks in with Yodels and Little Debbie clocks in with the shameless Swiss Rolls. All of them named after some sort of play on words about Alpine folk music. Anyone dare explain this to me? Recently had lunch with friends on the Upper West Side. Their 9 year old daughter offered me two of her cookies. Oreos or Vienna Fingers. I took the Fingers but would have preferred Hydrox. Ate them on the subway after an abstinence of at least 35 years. They weren't half-bad.